Drivers flock to the pumps as outages, bottlenecks fan fears of a gas shortage. NEW YORK (CNN/Money) - Gasoline prices spiked as high as $5 a gallon in some areas Thursday as consumers fearing a gas shortage raced to the pumps. Drivers in Atlanta said stations were charging well over $3 a gallon for regular unleaded, and at least one station in Stockbridge, Ga., was charging customers $5.87 a gallon. The price hikes were felt nationwide, with gasoline surging to $3.59 in Boston, $3.58 in Milwaukee and well above $3 in parts of New York. Nationwide, the national self-serve unleaded average was $2.68 a gallon, AAA said on its Web site, an increase of 6.1 cents -- and a record high. But a AAA spokesperson told CNN that prices were rising so fast that its Daily Fuel Gauge Report cannot keep up, and the price reported there more accurately reflects gasoline prices as of yesterday morning. A CNN survey of 25 Georgia gas stations found an average price Thursday morning of $3.09 for regular gasoline. The runup in prices prompted President Bush to warn against gouging and to encourage Americans to conserve. (For more on the president's comments, click here). Consumers have been making a run on the pumps in the wake of Hurricane Katrina as refinery shutdowns and power outages fan worries of a looming gas crisis. "We know there will be some spot shortages (but) there's gasoline in most areas to meet most people's needs," Gregg Laskoski, managing director of AAA in the South, told CNN. 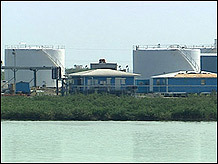 Hurricane Katrina forced several refinery operators in the Gulf Coast, where about 40 percent of the nation's refining capacity is located, to shutdown. Pressuring gas supplies even more were power outages that shut down two major pipelines that pump gas to key terminals and distribution centers along the Eastern U.S.
Colonial Pipeline reported Wednesday evening that it restored its pipeline to between 25 and 35 percent of capacity while Plantation Pipeline said its operations were back to 25 percent of normal. But with both pipelines operating below full capacity, the entire distribution process gets backed up. To meet the onslaught of demand, stations have raised prices overnight. Some experts are saying gas could $4 a gallon, but whether those prices will be sustained remains to be seen. (For more, click here). AAA's Laskoski urged people not to fill up their tanks if they're not traveling and said people should conserve fuel by keeping their cars properly maintained and tires properly inflated. Average nationwide gasoline prices have gained more than 40 percent in the last year, and crude prices are hovering near $70 a barrel. How much more pain can consumers bear when it comes to gas prices? Click here.